Why Kelp And Not Other Iodine Supplements? Why Kelp And Not Other Green Superfoods? Why Kelp And Not Other Sea Vegetables? ﻿Fukushima update: Kelp may be affected by the nuclear accident at the Fukushima reactor in Japan. I suggest atlantic ocean kelp for this reason, as it would be a little less affected. However, the radiation blows around the world eventually, so there is little that can be done about that in the short term. Slightly more radiation does not negate the benefits of kelp described below. Kelp, or Ascophyllum nodosum, is a nutritional seaweed. It is an edible plant that grows in shallow ocean waters. The right brand of kelp is a life-saving food supplement today that I recommend for everyone. It is extremely nutritious, safe to eat, inexpensive, and widely available. One must not take kelp if one has Grave’s disease or hyperthyroidism, as it can aggravate this condition. Kelp, which includes several species of a common sea plant, is a wonderful food and food supplement in dried form if the brand is correct, and only if the brand is correct. The right brand of kelp is almost a life-saving food supplement today that I recommend for everyone. It is inexpensive, widely available, safe and beneficial. Adverse reactions to kelp are rare, and it can be taken with almost all hypothyroid conditions. One must reduce it, in some cases, if one has Grave’s disease or hyperthyroidism. Some brands seem to be more toxic and are best avoided. The brands of kelp capsules, granules or powder that I recommend include Nature’s Way, Solaray, Country Life, Endomet, Now, Ecological Formulas, Vitamin Shoppe, Office Gudni Gudnason, Azure Farm, Solgar, Frontier Herbs and Monterrey Bay Herb Company and Kelp from realrawfood.com. Other brands may not work well, in my experience, and may be somewhat toxic. A brand that may not be very good is Maine Sea Coast bulk kelp (laminaria digitata). I am not sure why this is so. Everyone today is low in minerals, due to modern agricultural methods, depleted soils, food processing, weak digestion, and perhaps other reasons. Kelp is well known as an excellent source of many trace minerals. There are few such sources anywhere on earth. Besides the well-known trace elements such as iron, copper, zinc, manganese, chromium and others, kelp supplies many of the ultra-trace minerals such as germanium, iridium, rubidium and others. Kelp also supplies, calcium, magnesium, sodium, sulfur and other macrominerals the body needs. Kelp is also a food, so the body is more able to selectively absorb what it needs from it. Kelp is also an all-natural product, which avoids some toxicity. They do not contain the ultra-trace minerals. They contain the wrong balance of minerals. This is a complex phenomenon because many foods contain calcium. However, I find that kelp, carrots, carrot juice, sardines and raw dairy contain the most usable forms of calcium. The calcium found in pasteurized and homogenized dairy, in seeds and nuts, and in a few other foods is not as well utilized by most people. This is kelp’s best known benefit. Kelp is rich in iodine, and everyone needs more iodine. The reason is the overwhelming amount of iodine antagonists present on planet earth today. These are bromine in breads and soda pop, chlorine in drinking water and elsewhere, and fluorides in water supplies and foods. The iodine antagonists interfere with our iodine uptake and utilization, causing widespread thyroid problems in most women, especially. It also causes many other health problems, as well. Fish and seafood are other good sources of bioavailable iodine. However, they are too high in mercury to be eaten regularly today. Iodized salt provides some iodine, but is not enough, in almost all cases. Also, the iodine in salt is not that well utilized. Some doctors prefer not to use kelp because the amount of iodine in kelp can vary greatly. This is a concern, but not a major concern because kelp is a natural food and from our research, so far, the body seems able to regulate the amount of iodine absorption. Why Kelp and Not Other Iodine Preparations? Safety. The right brand of kelp is less toxic. All the other iodine preparations listed above seem to build up in the liver to some degree, indicating some toxicity. All single-mineral products can interfere with the absorption of other minerals. Minerals all compete for absorption to some degree. Taking a balanced food such as kelp, rather than a single mineral product, appears to be much safer for long-term use, which most people need. Kelp is more yang. This is important, although it may sound a little esoteric. The bodies today are all yin, and taking yin supplements always weakens them further. Kelp is significantly more yang because it is a natural food, and it naturally contains a lot of salt, which is yang. Kelp contains at least 20 trace minerals, plus other nutrients, so it serves several nutritional purposes at the same time. Kelp is much less expensive than some other iodine products, especially considering that it is a whole food and “green food” supplement as well as a source of iodine. NOTE: In a few rare cases, I found that Lugol’s solution or Iodoral was needed for a short time to prevent goiter. After the body heals and becomes more balanced, this was no longer the case. Protein. One hundred grams of kelp also contains 1.7 grams of protein. Some vitamins A, B, C, D, E, and K. Kelp is also particularly rich in folate. Fatty acids. Kelp contains some fatty acids, including a little of the omega-3 fatty acids, and others. Why Kelp & Not Other Sea Vegetables? Kelp is much more yang. As mentioned above, this is very important. The other “green superfoods” are much more yin, which is harmful, even if they are very nutritious. Kelp keeps its potency better and does not turn rancid nearly as easily. The high salt content of kelp acts as a natural preservative. Exposing dried vegetables, especially powders, to the air causes them to break down quickly and some will turn rancid. All green superfoods should always be in capsules and preferably kept in the freezer. However, very few of them are sold this way. Kelp does not contain spirulina, chlorella or blue-green algae. These common algaes many “superfood” formulas appear to be somewhat toxic for human beings. They seem to build up in the liver, indicating they are not as compatible with human physiology, no matter what heath benefits they may offer. Kelp has much more iodine, and I find this is absolutely needed today. Why Kelp & No Other Sea Vegetables? Kelp is not the same as bladderwrack, Irish moss, dulse, nori, hiziki, wakame and many other sea vegetables, so do not confuse them. The main difference, for therapeutic purposes, is that the brands of kelp I recommend have lower levels of toxic metals and a much higher alginate content. The alginates in kelp help bind the mercury and other toxic metals found in all products from the sea. This is important because eating the other sea vegetables, as with eating much fish at all, will result in mercury and arsenic toxicity, unfortunately. I do not recommend the other sea vegetables, except for occasional use, and I do not recommend any fish or seafood except for 3-4 cans of sardines weekly for adults, due mainly to the mercury problem in all products from the sea. As mentioned above, kelp is a very yang product, meaning rich in salt, exposed to a lot of sunshine, and of a more contracted, “drier” nature when the water is expelled from it. Such qualities are needed today because most food has become far more yin or expanded and cold, thanks to genetic modification and other reasons such as pesticide use. Kelp is therefore a balancing food and this may be one reason why it seems to work so well with so few problems, in our experience. The yang quality of kelp does, however, make it a more powerful therapeutic food, and this could be one reason why it causes more reactions than eating broccoli, for example. This may also be a factor in why the toxic metals in kelp, in particular, are not well-absorbed. This will be researched more in the future. A drawback of kelp and all sea products is the presence of toxic metals, mainly mercury and perhaps arsenic. However, I have not found that our clients’ hair mercury or arsenic levels rise due to taking kelp at up to 4000 mg daily. In contrast, ingesting other sea vegetables such as dulse, wakame, nori and others can raise the hair mercury level. Two situations seem to cause reactions to kelp. Individuals with this condition often need to avoid kelp completely until the condition has resolved using a complete nutritional balancing program. All cases, so far, have gone away on this program. However, when hyperthyroidism is present, kelp is usually not well-tolerated. For more details, read Thyroid Disease, Hyperthyroidism, and Hyperthyroidism Interview on this site. 2. A Detoxification Reaction. Occasionally, a person has a purification reaction when starting to taking kelp. The usual symptoms include irritability, perhaps nausea, and a few cases of hair loss. Most of these reactions are temporary and they are healing reactions. Most are due to the removal of toxic elements such as chlorine, bromine and fluorine compounds from the body. Usually, one just needs to reduce the dose for a while, and then work up slowly. One man reported a reaction to kelp that went away when he took zinc along with kelp. Everyone seems able to take kelp, eventually, if the person follows a nutritional balancing program. Like the product GB-3, some people must go easy at first, but everyone eventually seems able to take it. Adults can usually take at least 1800 mg of kelp daily and up to about 4000 mg, preferably with meals. That is how deficient many people are in iodine and the other minerals found in kelp. 4000 mg is about 6 capsules daily. Capsules, Tablets, Granules or Powder. Kelp capsules are better than tablets because capsules are larger, so fewer are required. Powdered or granulated kelp is okay, but it does not taste good so the capsules are better for this reason, as well. Kelp Leaves. Dried kelp leaves are also sold in health food stores, sometimes called kombu. However, this must be powdered or cooked to be absorbed. Powdering it requires special equipment. Cooking takes an hour or more and damages some nutrients in the kelp, so I do not recommend it. Children over the age of about 7 may take 600 mg of kelp capsules daily. Younger children and babies usually do not need it, although some might benefit from 100-300 mg daily. Kelp can also be used as a body wrap to allow a person to absorb more minerals, perhaps to absorb other phytonutrients, and to help remove some mercury and copper through the skin. It works! So far, women seem to need it more than men, for some unknown reason. Perhaps it is because women are higher in copper, so they benefit more than men. This procedure and the kelp bath may particularly help those with electromagnetic field sensitivity or EMF sensitivity. Also, most people can benefit a lot from this procedure when beginning a nutritional balancing program. Most need the procedure every day for 6 to 12 months. One can wrap the entire body, which is best but is somewhat messy. One can also wrap just the feet and legs. This is not quite as good, but it is less messy and can allow a person to move around more easily with the wrap on. Kelp. For one wrap or one bath, you will need about 1 pound of powdered kelp. Brands that are acceptable include Frontier Herbs, Starwest Herbs and Monterrey Bay Herb Company (www.herbco.com) in the USA, which is the least costly, I believe and also Kelp at . Other brands of powdered kelp are probably okay, but I am not sure. Water. You will also need about 4-10 cups of water. You can use tap water, spring water or distilled water. Whole Wheat flour. You will need a few tablespoons of flour to make the kelp wrap more sticky so it will stay in the skin better. The amount of kelp and water depends upon whether you wrap the entire body, or just the legs. Wrapping the entire body is best, but is somewhat messy. Wrapping just the feet and legs is not quite as good, but it is less messy and can allow a person to move around more easily with the wrap on. Boil Water. First bring about 4-10 cups of water to a boil. Then turn down the flame to simmer. Add kelp. Slowly add ½ to 1 pound of kelp powder. The full body wrap requires more. Stir it in slowly to prevent it from burning. Cook. Let the mixture simmer for one hour. Check on it from time to time, stirring so that it does not stick to the bottom of the pot and burn. Break up any lumps of kelp. Add a little more water if it gets too dry. The cooking is important to make the kelp becomes more yang and to kill any bacteria and other micro-organisms that may be mixed with the kelp. Add flour. After an hour of cooking, add a little whole wheat flour to make the kelp more sticky so it will stick better to your skin. Usually, about 1 to 2 tablespoons of flour are all that are needed. This is a little messy, but hopefully you can make it fun. Spread a plastic shower curtain on the floor and stand or sit on it. You may also apply the kelp while sitting in a bathtub, or lying or sitting on a towel on the floor. Two people can help each other. Undress and apply the kelp, either to the whole body or just the legs and feet. You can wear a bikini bathing suit if you prefer. You may need to bring a space heater into the room to keep the room warm. A thin layer of kelp will dry on your skin. This will make it more difficult to recycle and reuse it. So it may be better to apply a thicker layer that will remain moist for the two to three hours. Do not apply kelp to the elbows, knees, and underarms as it will not stay on very well. Once the kelp is spread on the skin, let it stay there for at least 2 hours and up to 3 hours. After 2 to three hours, brush off the kelp or use a spatula to collect it. Put it in a container, and place it in the refrigerator to reuse it the next day. Moving About. The less you move about, the better the kelp will stay on the skin. If you need to move around, you can put clear food wrap over the kelp, wrapping it around your legs and trunk. Another method is to buy some cheap, plastic “body bags” or lightweight plastic jump suits used in “clean rooms” of some factories. Slip into one of these and you can also walk around without leaving a trail of kelp wherever you go. Reusing the Kelp. If you sit or lie down on a plastic shower curtain, you should be able to collect most of the kelp. Store it in a container in the refrigerator until the next time you do the wrap. To reuse the kelp, add some water to the kelp until it is a thick paste. Put it back on the stove and warm it up to near body temperature. You can boil it quickly to kill germs if it is contaminated or sweaty. However, you do not need to cook it more. You can reuse the kelp up to 20 times. 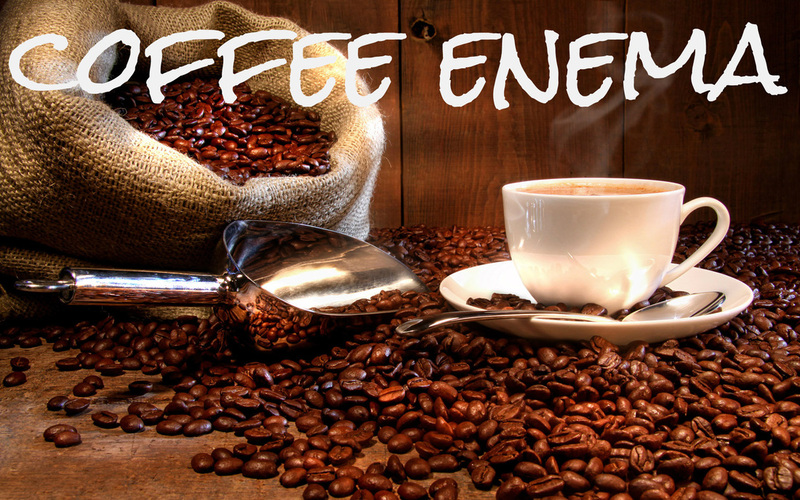 Coffee enemas, the pushing down exercise and red lamp therapy with a kelp wrap. Since you must relax for 2-3 hours with the kelp, it is a good time to do Coffee Enemas – either one or two enemas back-to-back. This is a very efficient use of time! Spread a vinyl shower curtain liner on the floor of the bathroom, or on a yoga mat, or wherever you do coffee enemas. Apply the kelp first. Do not put kelp on your buttocks and perhaps not on the back of the hips to make doing the enema easier. Then lie down and do one or preferably two coffee enemas back to back, as this is more powerful. You can also do the Pushing Down Exercise while doing the coffee enemas. The pushing down exercise is definitely easier with the coffee inside you. You may also shine a Reddish Heat Lamp on your abdomen while doing the wrap and the enemas. The kelp bath is not as powerful as the kelp wrap, but is good. Mix a pound or more of kelp powder with a few cups of water, and cook the mixture on a low flame for one hour, as per the directions above for the kelp wrap. Add the cooked kelp (with its water) to a tub of warm to hot bath water, preferably pure water without chemicals. The bath water should nearly cover your legs. More water is not necessary. Enter the tub and soak for at least 20 minutes and up to one hour. If possible, do not shower off and instead leave the kelp on your legs. It is okay to shower, if needed, but not quite as powerful. This procedure can be repeated up to three (3) times per week for up to one year. The exposure to the bath water is very yin. That is why one must limit the number of baths to 3 per week. Most bath water is somewhat toxic, although this varies depending on the water supply. The kelp is not nearly as concentrated as it is with the kelp wrap. It is not possible to reuse the kelp when it is diluted in a bath. One cannot do a coffee enema at the same time. However, you can do a peroxide and ozone bath at the same time (see below). Hydrogen peroxide, ozone and red heat lamp therapy with your kelp bath. For a more efficient use of time, you can add about 1-3 cups of 35% food grade hydrogen peroxide to the bath water. The amount depends how sensitive you are to the peroxide. If you have an ozone generator, you can also place the ozone output tube in the bath while you are soaking in the kelp. You can also rig up a reddish heat lamp to shine on you while you are in the bath. If you try either the kelp wraps or the kelp baths, please give me feedback as to their effectiveness, if you can judge this, since this is a research area of nutritional balancing science. Amster E, Tiwary A, Schenker MB. Case Report: Potential Arsenic Toxicosis Secondary to Herbal Kelp Supplement. Environmental Health Perspectives. April 2007;115(4).